The launch of a scheme which aims to bridge the skills gap in the construction industry has seen such an overwhelming response that a further event has been confirmed. 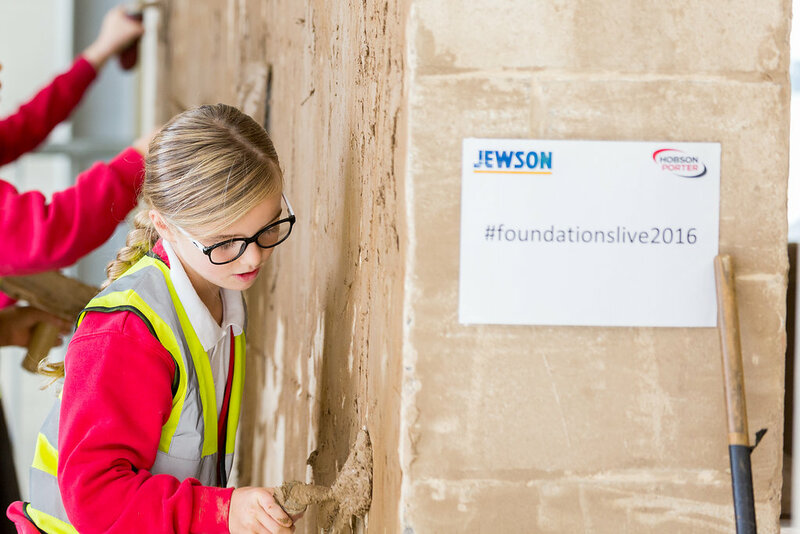 Foundations Live 2016, which launched Hull-based construction firm Hobson & Porter’s Foundations scheme at Bishop Burton College, saw hundreds of students from across Yorkshire and Lincolnshire engaging with businesses from all walks of the construction industry. More than 350 students, ranging from primary school pupils through to construction apprentices, have already shown a hugely positive response from the event, which kicked off the campaign to inspire and encourage people of all ages to consider a career in construction. Foundations also brings together businesses to pledge time, support and knowledge to improve the employability and skills of construction students. Hobson & Porter works collaboratively with its supply chain partners in order to share a wealth of knowledge, time and support to improve the skills and employability of all people interested in a career in construction. As a result of this response, Hobson & Porter has already earmarked the 21st September 2017 as the date for the next Foundations Live event, again at Bishop Burton College. GoConstruct estimates a growth rate in the industry of 2.5% each year for the next five years, equating to more than 250,000 new roles on a national level. With more than 16,000 construction jobs anticipated throughout Yorkshire and the Humber over the next five years, Hobson & Porter is working collaboratively with partners, such as building merchant Jewson and the college to address the construction skills shortage. Hobson & Porter’s Business Development Director Dave Blades said: “Our company not only aims to provide the region with high quality construction projects, but also to provide opportunities for the community so everyone can benefit from the work we do. Chris Reader, Jewson Sutton Fields Branch Manager, said: “Jewson is proud to support an initiative which aims to support and drive recruitment to fill potentially thousands of positions available in Yorkshire and the Humber. Visitors to the event included Year 4 primary school pupils from St James’ Church of England Academy, secondary pupils from Sirius Academy North & West and more than 80 construction pupils from North Lindsay College in Scunthorpe. 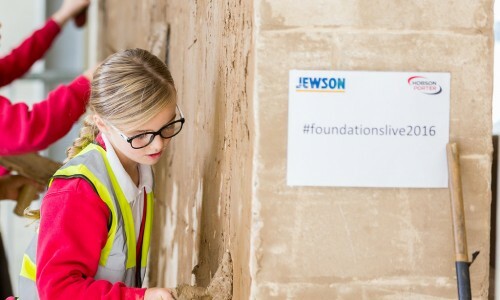 The Foundations programme aims to raise awareness of the opportunities available in the construction industry and enlighten people about the opportunities available by creating links between businesses and education establishments and create valuable skills to ensure people enter the construction industry with a high standard of ability. The initiative aims to continue driving personal development to enable anyone looking to enter into the construction industry to reach their goals. Hull Children’s University, Bishop Burton College, Driffield School and Emmaus Hull and East Riding are principal beneficiaries of the scheme during the 2016/17 academic year, with the bank of good provided by Foundations partners distributed equally amongst the educational partners. Who should attend Foundations Live 2018? Foundations Live brings the concept of creating a sustainable workforce into a live event space at Bishop Burton College. As a careers event, it gives pupils the opportunity to find out about the career options in the industry, where they train and how it can be funded. With demand already high and the event fast approaching, schools and colleges should register as soon as possible to avoid disappointment. Foundations Live is the ideal place to showcase your products and services, regardless of your organisation’s role in the construction industry. It provides a platform for exhibitors to meet with employees of the future to discuss future opportunities and share the skills and experience needed to work in their organisation. It also acts as a B2B networking event, where companies can meet, network and do business together, all under one roof. There are a limited number of spaces for exhibition stands still available so if you wish to exhibit please get in touch before it’s too late! It is estimated more than 9,000 jobs will be available in the construction sector in the next five years in the Yorkshire and Humber region, with total growth forecast at 1.1%. Foundations Live gives adult re-trainers the opportunity to find out about the variety of career options in the industry, giving them face-to-face meetings with potential employers and teaching them about the range of training and funding available in the industry. If you are a training provider that would like to arrange a visit to Foundations Live, please register your interest online. Foundations Live presents the perfect opportunity to meet and network with other construction professionals. With large numbers of trade delegates and industry professionals present and keen to meet, greet and do business, the event is the ideal place to be for those wishing to make the right contacts. For those who interested in attending please register your interest online.